"May your dreams be larger than mountains and may you have the courage to scale their summits." - Harley King. Photo Shot in Atok, Benguet on a Sunset in some obscure corners of Halsema Highway that provides a glimpse of the rolling hills of the Cordillera's. Amidst the humdrum and thousands of people milling over at Panagbenga Festival in Baguio City, we chose to just pass by it for an outreach climb at Mt Timbac. 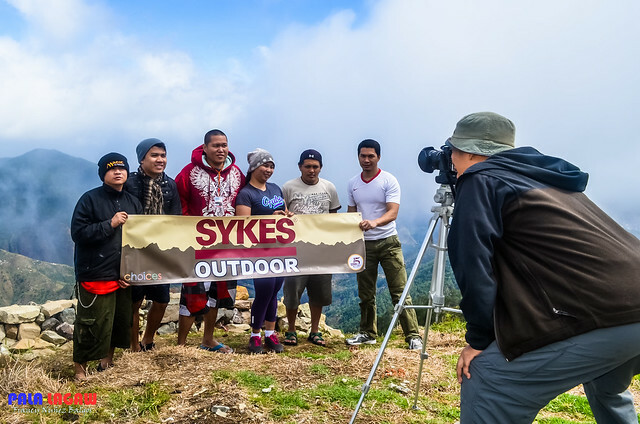 Though it's my first time to participate, this is actualy the 3rd time for Sykes Outdoor to visit Mt Timbac. The reason is that they have adopted the Mangoto Elementary School, this school can serve as a jump off site for a fun climb at Mt Timbac summit, practically 30 minutes away, and for three years now they have reached out to students who huddle in this humble school for learning. Though it won't be very far from the summit, there is very limited transporation here, but roads are concrete all the way up. 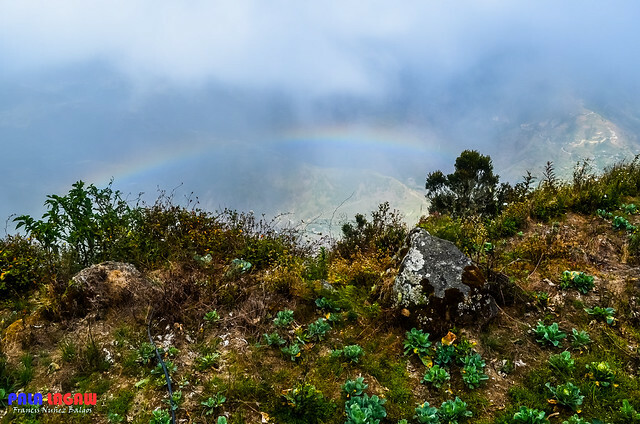 It will actually require a skillful and brave driver to hike up as the road is very steep, and still unfinished on some part. A simple mishap may cause the vehicle to tumble down the ravine and probably end up as road kill back in Halsema Highway. The school, it served as out shelter for the night, protecting us from the cold. Temperatures can drop really low, at some time, the temperature outside went as low as 3' while we are huddling inside at 8'. We have come prepared with winter clothing, but I never thought my warmers would not be enough. 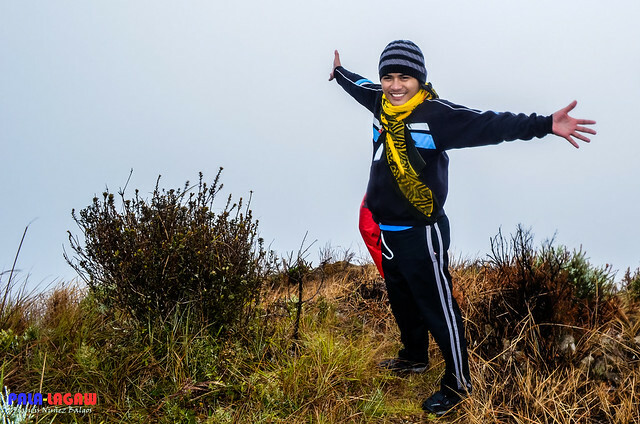 One thing that compelled us to visit here is that Mt Timbac is the 3rd highest mountain in Luzon, being adjacent to Mt Pulag and Mt Tabayoc with the same weather conditions, Mt Timbac is a very good try out for training, at least to experience the extreme weather. The Kabayan Hills along the slopes of Mt Timbac is a heritage site. The slopes o this mountain is home to a community of vegetable farmers along private ancestral lands. 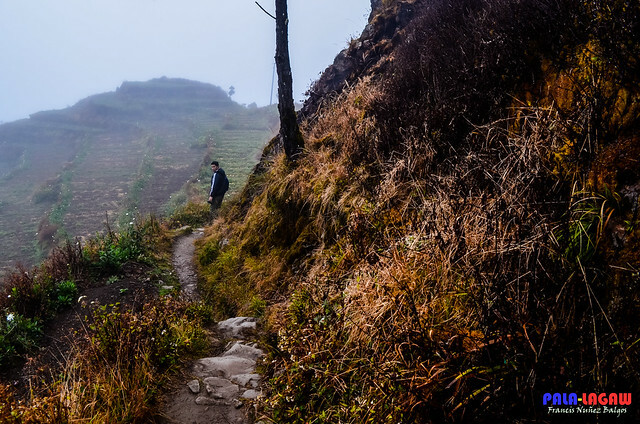 If you are familiar with the trail, there is no need for a guide, just make sure that you don't step over tilled farm lands for this is a vegetable terraces all the way up to the telecom towers in the summit. The locals are very friendly with visitors, and the visit was free, we were even housed in the school for a night and were expected upon our arrival by the School's key keeper and the school coordinator teacher Jenalyn. Most of us were inexperienced climbers, so this fun climb served as our training ground for respecting local traditions and cultures, and someof the guiding principles every start up mountaineer should have. We didn't expect any VIP treatment, just a simple request that we be allowed to take shelter in the school. It was for a good measure, as I never expected to experience extreme cold weather. Certainly, our great welcome was the cold foggy weather of Benguet, the zero visibility, the friendly dogs shivering in their furs, or the howling wind entering the classrom window. All through the night, we were hoping for the weather to clear as we set off to trek the summit at the break ofdawn. Probably it was a good thing that we set off when it was still pitch black, we can't see the surrounding height of ravines but we can feel our bodies acclimatized. High alitude indeed, there was a moment when most of us feel hot though its brazenly cold, and the sudden jolt of headache came, but as it left, we set off walking the trails in darkness, making sure not to makeany untoward noise as the people here are still sleeping, let alone the dogs that came barking and sniffing at us. Photo shot in Mid Afternoon along the Marker for the Highest Highways of the Philippine highway system in Halsema Highway. 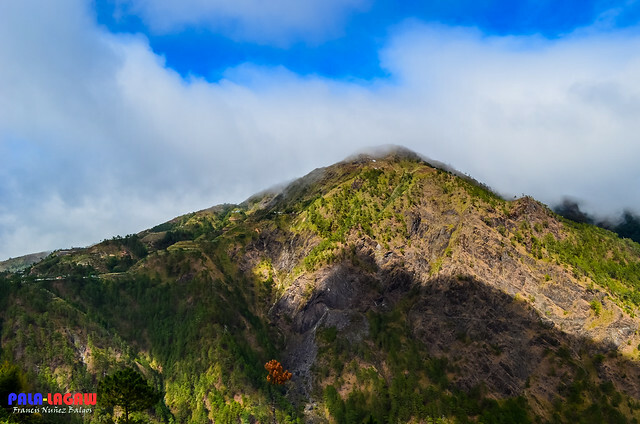 Photo taken as we are leaving Benguet. Baguio City is the usual staging or gathering. From here to get to the jump off point in Atok, Benguet, take a bus ride along Dangwa Terminal take a bus to Sagada or Bontoc to be dropped down at KM 55, along Halsema Highway. The drivers would normally know where to drop you off a small sign board along the highway that says "Welcome to the Mummy Caves of Timbac, Kabayan, Benguet". We rented a jeep for this trip,the driver to actually accompany us into the school. With this, we took a leisure time along Halsema Highway. Remember tha Halsema Highway is probably the most scenic highway in the country not to mention that it's the highest elevated there is. Sunsets can be very beautiful here, the views of Sto Nino Mines, the Carved rock tunnel, the rolling hills of Atok and the marker for the Highest highway where I took the shot of Mt Timbac on the first photo. Most of us are photo enthusiast than mountain climbers, though a part of me felt saf that the vehicle brought is to the school,no sweat, the climb would have been fun and physically challenging, but it was getting late, and it's really cold as high altitude mountains get. 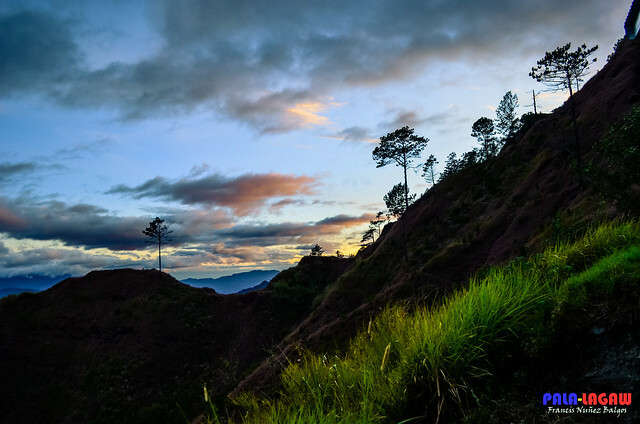 Sunset Photo of Benguet, the scenic hills and trees that scatter in the area. 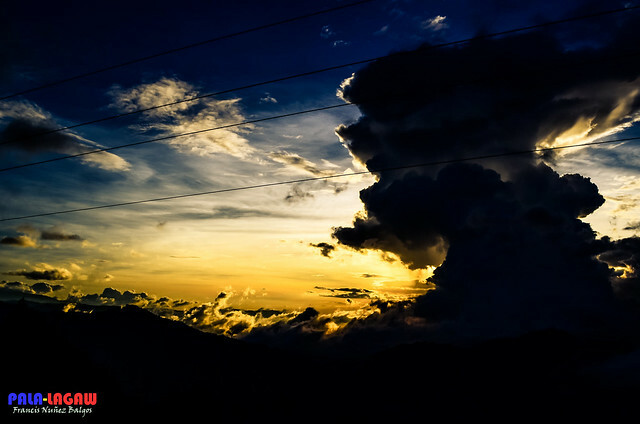 Sea of clouds, a common sight in Benguet for either sunset or sunrise. One of the breathtaking cloud formations we have witnessed. Most of us where tired from dodging the heavy traffic off from Baguio,but the 2 hour drive to Atok Benguet was refreshing. We were resigned to the fact that we are in the country's salad bowl. Our ETA was to arrive at Mangoto Elementary School just in time for the sunset, we where late, seeing that most participants are first time visitors to Benguet (my 3rd time personally), it can't be helped that we request for our vehicle to stop at every scenic landscape we see along the highway, landscapes bathed in Sea of Clouds, rolling hills and sways and ways of Pine Trees, not to forget that it's the sunset setting in the East. 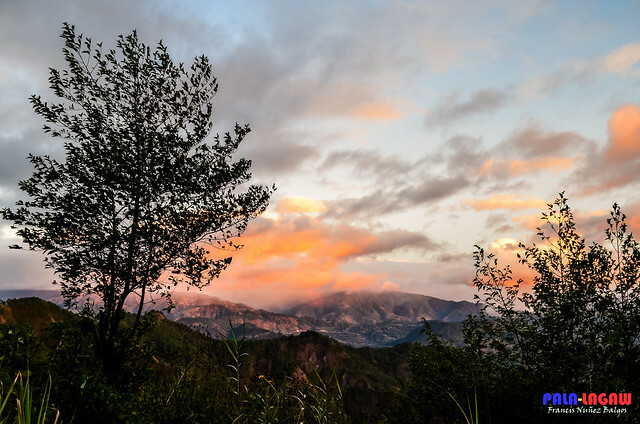 And so it was that the purple skies bade us goodbye but then we were holding our breaths as the jeep is now scaling the almost concrete steep road along the slopes of Mt Timbac. Upon arrival, we were greeted by the school's key keeper, it was just around 6:30 PM and yet it's pitched black with almost no visibility within 3-4 feet due to the heavy cloud that blanketed us. We capped the night cooking our meals, shivering from our jackets, and picking out our own spot in the room while sharing stories of ourselves and our life's adventures. Our nights socials had been great, while at the bacl of our heads we are crossing our fingers hoping that the sky would clear on the early break of dawn,because then we can witness the sea of clouds that made Mt Pulag famous. Yes, the same sea of clouds can be seen from Mt Timbac and more so during sunrise. Photo Credits: Kristine Ebdani Villapana, shot with a camera phone on our arrival at Mangoto Elementary school, see the thick fog that blanketed us on this early evening. The shadow is highlighted by the headlight coming from the jeep that brought us here. Waking at around 4:30 AM, felt like just taking a nap of 15 minutes. The biting cold even when I was lying in pine wood kept me awake for the most part. But I was ready, mind and body for this experience. We were mostly ready except for our team leader who kept steeling minutes of sleep. Our excited noises woke him up. Our preparation was taking double heaps of clothing, try covering most of our skin and bring everything that would protect us from the strong blowing wind outside, my 4 year old umbrella came to my aid once again. 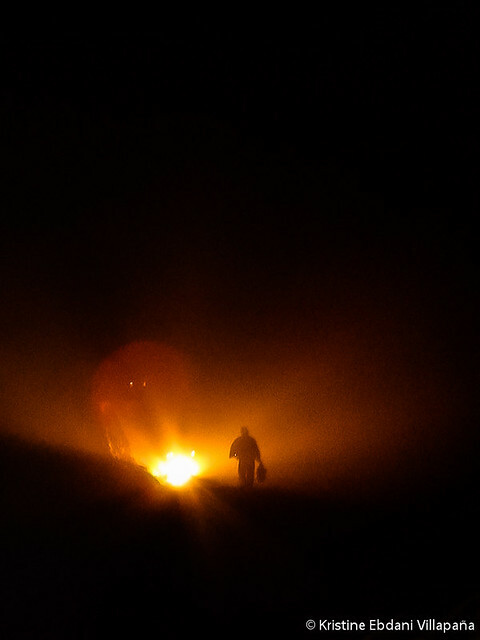 The only drawback is that we can't take decent pictures during our ascent, with headlamps that we share with each other, and walking in single file along concrete and vegetable paddies, skirting away from barking dogs, and sending out scouts to establish our path in the pitch darkness. We were walking along fields or Parsley's, patches of Cabbages, of healthy Carrots and their flowers blooming, of harvested Potatoes and their freshly tiled soils. While in the slow gathering light, we see ourselves along edges of steep ravines, that our trails were festooned with wild Daisies of pure white petals and yellow hearts winking. Today, the moon's a harsh mistress, and we waited even beyond the known Sunrise's hour, but the clouds kept the sun away from us, we were almost at the summit. Shivering from the cold, my clothes of Cotton covers me from the strong Gale's that holler at the summit, with whitened knuckles and stinging wind burns, I hold my hands together, each of us, like wet newborn puppies staying out in the rain to await our ration. Yet never have I seen any discontent faces, what a great disposition our team has, we even tried to bet if we could take a photo of ourselves without our protective clothing and open to the mountain elements. Heck! I can't even imagine parting with my wet sport jacket at this point. But I was happy and it’s the climb after all. 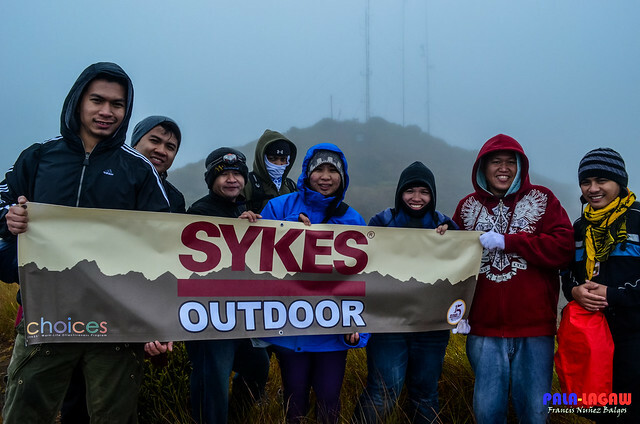 Outdoor Crazed, members of Sykes Outdoor that participated in this outreach and fun climb. All shivering from the cold gust, at our back is the silhouette of the Mt Timbac Summit. We gave up at around 8:30 after a few minutes of seeing the first farmer to pass by our location; she came harvesting a few fat carrots near the Mini Calvary. We brave the strong gale winds, and went to the summit to huddle, luckily as we stood at the summit, we were able to start taking pictures, the strong winds are starting to give out, here is where I started photographing close ups of flowers with their wet petals, of the paths that we take along vegetable paddies, the slippery trails, the Mini Calvary and the steep slopes beside it. There was no time to be afraid of heights, I would have thought twice if I was seeing a clear horizon and realized to myself that I am really standing in one of our country's highest mountain peaks. What an effort it was really, being more afraid that my heavy camera would give out due to the cold moist creeping all over us than the high altitude we were in. There's really no explaining how inspiring nature can be, if you allow it to be. 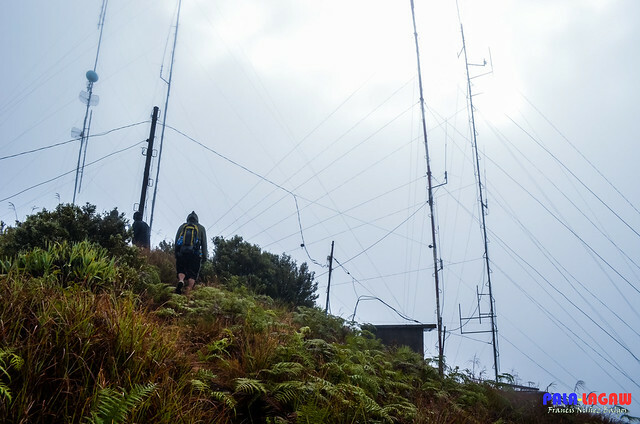 Even without clearance, we finally took chance to stand in the summit, with its antennas, ferns, Spanish Mosses and bushes along the trail. 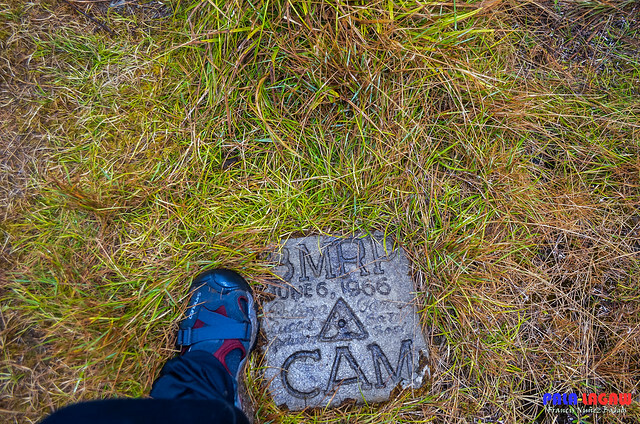 Shot of my feet, here I stand in the Geodetic Control Point (GCP) marker in the summit. Here I stand in the edge of a steep slope. It feels like standing in a rooftop of a skyscraper, and I'm standing near the edge. 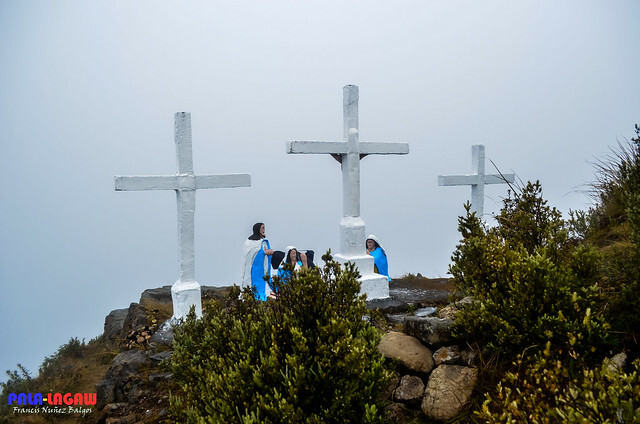 The mini calvary located near the summit, overlooking the hills towards Kabayan. Photo Taken from the mini calvary. 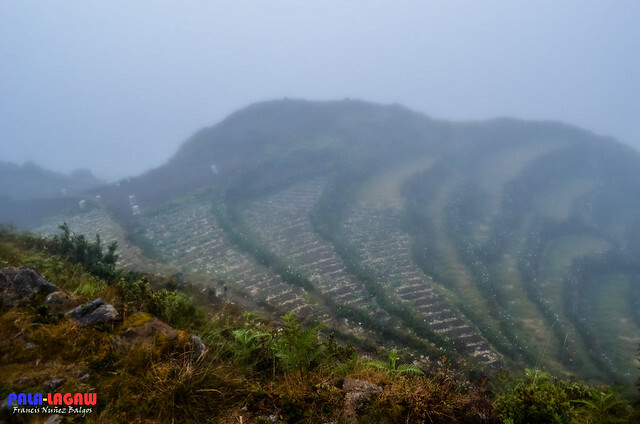 I intend to show in this photo, the steep slope and vegetable terraces. The thick fog just covers everything up. Photo taken along the trails on our way down, it's almost mid morning, yet its still grey cast and full of fog. Knowing what to expect, we brought gifts instead of cash. A box of school supplies is all that we offered. We left it in the classroom for teacher Jenalyn to sort out for the students. It’s amazing to know that the school continues to educate young minds in these areas even though located in a desolate place, where cold weather is probably felt all through the year. We waited for her the whole morning to come see us; probably she did while we were at the Summit. She was busy taking care of her baby daughter that she is on leave at the moment from teaching. Meeting Teacher Jenalyn had been a warming experience. It was the first time for me and for most of us to shake hands with an Ibaloi Woman. We went to her home before we headed back to Baguio to give our courtesy call. 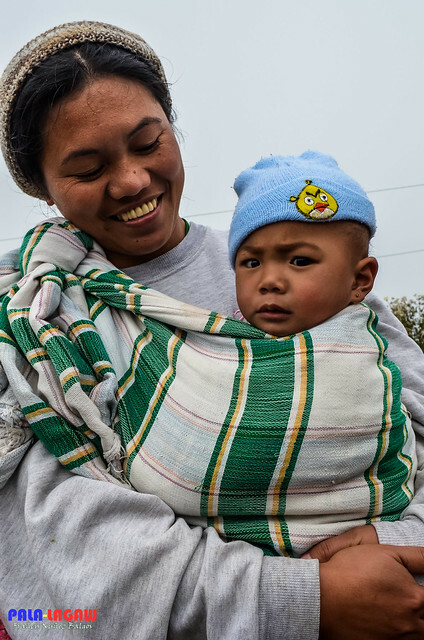 She was carrying her baby daughter with the natural pinkish cheeks, the result of Benguet's cold weather and cold spell. Her humble home was near the school, and she maintains a sari-sari store while taking care of her daughter and 2 other children that we also met. All with the same identical pink cheeks. Adorable people, but at last we couldn't stay long, we ask her if it’s possible for us to meet the pupils of the school, but she says that it’s a Sunday weekend and it’s a holiday for the next day. This makes it impossible for us to do so. I don't feel like this would be the last time I get to meet her or visit Mt Timbac, so long as I work for Sykes and get to be with these humble and adventure craze people from Sykes Outdoor. There wouldn't be a shortage of adventure with having a good disposition, and I will from here on be the chronicler, blogger, scribe if you say so. I just love to tell stories of adventure and places I've seen, for my life's journey. I hope that I didn't bore with the burst of inspiration that comes rather inconsistent but with determination. Meet Teacher Jenalyn and her baby daughter with the natural pinkish cheeks. Photo taken along the road, near the house of the Timbac Guide. As we wait for the clouds to clear so we could take a long shot of Mt Pulag from our vantage point. I've taken photos of rainbows several times, always looking up, but this is the first time I've seen a rainbow while looking down. How feeble the weather can get. We were getting impatient, one second we have a clearing sky, then the next would be a light rain. 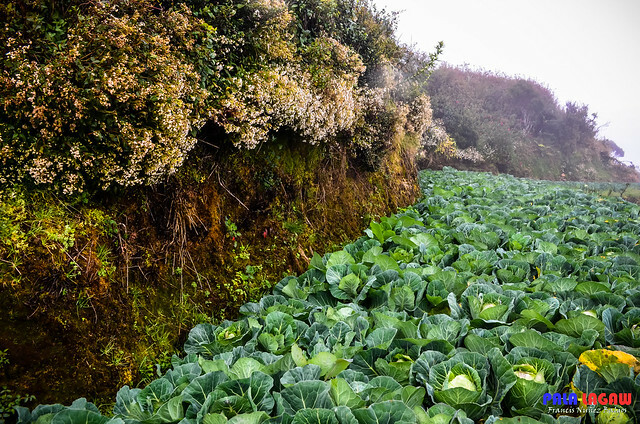 Some of the healthiest and fresh cabbages I've ever seen. On a closer look. 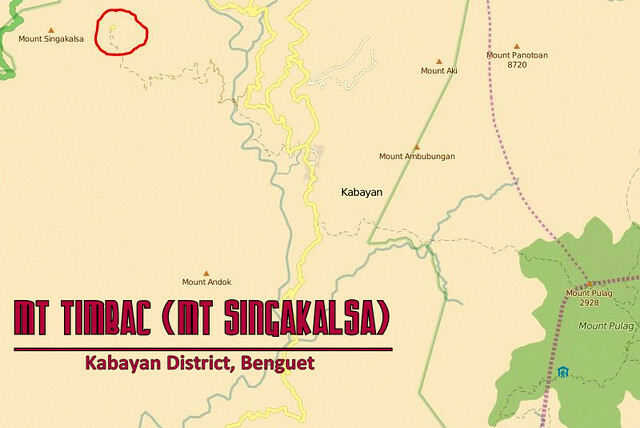 Mt Singakalsa is an a.k.a of Mt Timbac, a closer look on the map will show the Timbac Mummy Caves along the hills facing the town of Kabayan. The snaking green mark is the Halsema Highway along Atok, Benguet while the straight green lines is the Upper Agno River Basin. 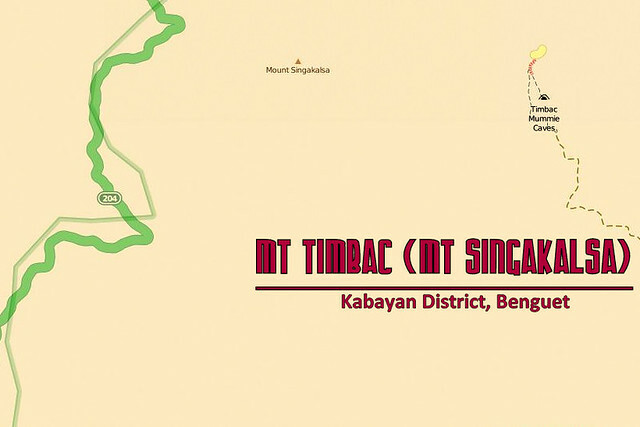 Mt Timbac as shown on the map and its distance from Kabayan, Benguet and the more popular neighbor Mt Pulag. I place a circle in the Timbac Mummy caves. thanks Mervs! I always find myself in awe of how detailed can you get in blogging. Its very helpful. I always forget littles things when I travel, getting myself lost in the momentum. Wow, I like the scenery though nakakatakot kasi masyadong mataas the summit is really cool. Thanks Paul.. the summit wasnt really just cool, its cold creeping to our bones, but the experience was really great. I know Mark.. Sorry about that. I feel like I have to give back more for the experience I had. And I know that this place would become very important, with people slowly realising the rich heritage we have. Now, this post is worth a bookmark in my site. Anung camera lang gamit mo? hahaha, ang ganda ng pics, sobra! Two things, were you allowed to take picture of the fire mummies or you just didn't want to? And what is Syker Outdoor? Hi Zion, I'm a Nikon user. Yung entry level lang gamit ko, Nikon 5100.
if we make a request, I think we can be allowed to take photos of the mummies. Pero ng bigay kasi ng caution yung guide, they dont really appreciate former visitors na ng take ng picture, then sort of make fun or vandalise these treasures in the internet. You know vicious people can be over the internet. I work in Sykes Asia, international BPO Company. Those pictures were so majestic! I hope I can experience this hike as well and see first hand the their rich heritage. I think you should Makoy, the experience on the hike was very rewarding. Nowadays, the Majestic National Park or Mt Pulag would feel like a mall with the hundreds or people milling over to climb it. You can experience a totally different scenario in Mt Timbak. wow!what can i say here! all your photos looks marvelous! they're breathtaking and so impossible for me to achieve haha. I think you are underestimating yourself. Ganda ng mga kuha mo, sir! You had amazing shots and priceless memories! :) I am envious much! Even though Mt Timbak is the 3rd highest mountain in Luzon, it's my first time to hear it and also I can't remember studying about it before in school. I think you have to make your post shorter, so that readers and viewers will read thoroughly your post. I have one post like this too, and I got an advice from other bloggers to make it short. Or you can make it PART 1 and PART 2 blog post. Anyway, I was amazed the way you make your shots, very detailed and precise. I was updating this post when you commented. I found it hard to encapsulate the entire experience in just one blog post. sorry about the long post! I my self really wish to be in this kind of adventure. yung parang sinusukat mo ang sarili mo kung hanggang saan ang kaya mong akyatin sa buhay mo. ka gaya nalang ng mga bundok na gusto nating tahakin. . It's so near Baguio and I haven't visited the place. It was nice reading about your adventure and the sites were just amazing plus it also was for a cause. I should try to visit Mt Timbak when I have a long weekend in Baguio. All the photos were perfectly shot, what an awesome place! Seems a nice summit to conquer. Just wondering lang why is it na parang kalbo na ang mountain? side note: I also agree with Pal Raine observation. Medyo mahaba nga ang post mo. This is an exciting adventure and the photos highlight your exploration in MT. TIMBAK. I like the mother and child picture... so native-looking. Being on top of that mountain is an extraordinary experience. I don't think I could climb up there in the time frame you had.